TAMPA, Fla. — Andrei Vasilevskiy passed an old friend for Tampa Bay's career shutout record. The 24-year-old Vasilevskiy posted his second consecutive shutout and No. 18 for his career, moving ahead of three-time Vezina Trophy finalist Ben Bishop for most in franchise history. Bishop was the starting goaltender for Tampa Bay when Vasilevskiy joined the team. "Bish is an unbelievable goaltender and I'm very proud to be No. 1 now in shutouts," said Vasilevskiy, who is tied with Marc-Andre Fleury for the NHL lead with six shutouts this season. Tampa Bay went ahead to stay with two goals 1:25 apart in the third. Kucherov got his 27th of the season at 2:16 and then forced a turnover that led to Yanni Gourde's 16th at 3:41. Tyler Johnson capped the scoring at 16:46, helping the Lightning improve to 7-0-2 in the past nine games. Carey Price had 34 saves for Montreal, which dropped its third consecutive game. "I thought we played a very good game up until (the third period)," Price said. "We laid an absolute egg in the third period. It's a frustrating result." 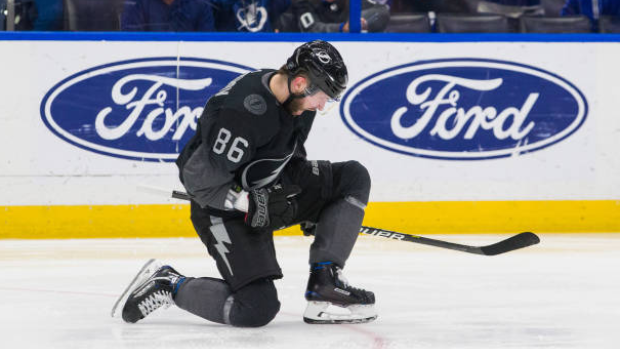 After two periods without a goal, Tampa Bay took advantage of a power-play opportunity when Steven Stamkos fed Kucherov for a one-timer from the left circle for his fourth consecutive game with a goal. Kucherov then knocked down a cross-ice pass attempt from Jonathan Drouin, leading to Gourde skating in alone for a wrist shot into the top far corner. "We cracked in the third," Montreal coach Claude Julien said. "I thought we played a good 40 minutes. In the third period, I thought a weak call on (Philip) Danault in a 0-0 hockey game and it ends up giving them their first goal. Second goal, Drouin not moving his feet and forcing a pass ... we're trying to get a change and it ends up in our net. So we cracked. "Every coach is going to tell you we need to learn from that. We do need to learn from that. We need to be better in those situations." Tampa Bay limited Montreal to just four shots on goal in the third period, helping Vasilevskiy extend his shutout streak to 125 minutes, 49 seconds. "He's just so competitive, he wants to make every single save and the past two games he has," Stamkos said. NOTES: Tampa Bay improved to 8-0-2 in the past 10 games against Montreal. ... Tampa Bay D Erik Cernak returned to the lineup up after missing two games with a lower-body injury. ... Montreal C Paul Byron missed his fifth consecutive game with an arm injury. ... Kucherov recorded his 50th career power-play goal, moving past Brad Richards for fourth-most in franchise history. ... Montreal was shut out for the fourth time this season. ... Gourde has six goals in nine career games against the Canadiens. Lightning: At Columbus on Monday. Canadiens: At Florida on Sunday.